Receive a gift certificate for one of downtown Racine's restaurants when you spend $250 or more on in-store jewelry or gemstones. Treat yourself or gift it to a friend! Offer valid for a limited time. Excludes custom designs and repairs. Earrings, pendants, rings, bracelets, diamonds, gemstones... Whatever you have in mind, we can help you design the dream piece for someone you love. This holiday, pull out all the stops. Come on in to talk with us about designing fine jewelry creations for someone special. 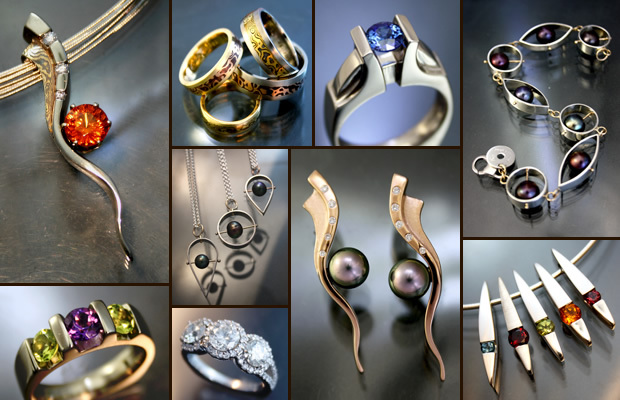 Custom fine jewelry in a relaxed gallery atmosphere. It's getting down to the holiday wire... no problem! We've got extended Holiday hours now through Christmas Eve. Make an appointment or just stop in! Never-Expiring Art Metals Studio Gift Certificates, good toward in-store items, custom work or jewelry repairs. Available in any amount, delivered to you or a lucky recipient! Complimentary gift wrapping with any purchase. Wish list and delivery service are also available!